Peerless-AV® announces the launch of its Motorized Collaboration Cart (SR598ML3). The Motorized Collaboration Cart now integrates the use of actuators, making it easy for users to raise and lower touch-enabled displays. Designed for applications such as education and corporate settings, the cart interacts with touch-enabled technology. 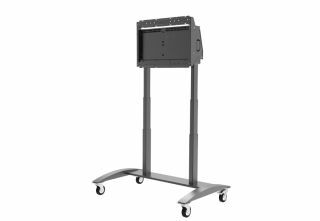 The Motorized Collaboration Cart is ADA-compliant, offering display height adjustment up to 25.6". The Motorized Collaboration Cart is UL962 listed and features a safety limit function, which automatically reverses direction when a collision is detected in an upward, downward, or lateral force. The Motorized Collaboration Cart offers a six outlet, 2160 joule-rated surge suppressor and a 15-foot pre-installed cord in the rear of the cart, as well as a large enclosure with space for small PCs, additional cables, and keyboards, and an opening for external WiFi antenna. The base is designed to fit easily through doorways, but does include rubber bumpers to prevent damage to walls and doors. For more information about Peerless-AV’s Motorized Collaboration Cart, visit https://www.peerless-av.com/en-us/professional/products/sr598ml3.